The vertical Ecostrad Ecowärme offers a sleek, space-saving heating solution for cramped or confined rooms. Finished in textured grey, these high-quality electric radiators combine advanced energy-efficiency with undeniable style. The vertical Ecostrad Ecowärme is the ideal choice for homes with restricted wall space, offering an intelligent heating solution from an elegant, upright frame. Including a whole host of energy-saving features, as well as a sophisticated anthracite finish, the Ecowärme is a stylish and intuitive upgrade to your existing heating system. 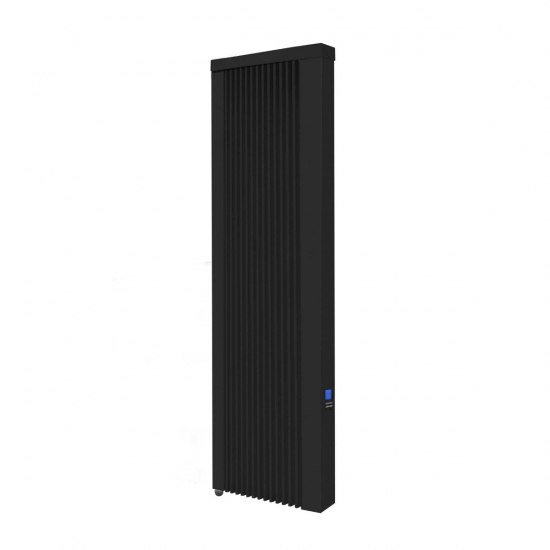 This 1000w vertical electric radiator is suitable to heat medium sized spaces, such as second bedrooms or guest rooms. The Ecowärme utilises the perfect balance of convection and radiation, heating objects and people directly as well as the surrounding air. Heat retentive stones within the radiator provide long-lasting warmth on top of the quick and effective relief gained by heating the air. The Ecowärme’s ceramic stones also prevent the radiator from working too hard to maintain temperatures, helping to improve running costs and overall energy-efficiency. Finished in anthracite, with a traditional fluted body, the Ecowärme provides a unique blend of traditional and contemporary styling: the ideal choice for sophisticated spaces. Suitable for easy DIY installation, the Ecowärme simply fixes to the wall and plugs into the nearest socket. For intelligent, energy-efficient heating, look no further than the Ecostrad Ecowärme. The Ecostrad Ecowärme is also available in horizontal orientations and the entire range can be purchased in white.